Two gothic romance tales for your lead-in to Halloween! I love October and Halloween. I’m also a huge horror movie fan, owning over 2000 in my person collection. I’m a particular fan of gothic romances like the old European and Hammer productions but also more recent treats like The Others and The Skeleton Key. My author friend, Jamie Fessenden, is also a horror movie fan. So we decided to create the gothika series, a series of dark gothic m-m romance tales. I loved writing these stories and I think readers who like a little dark in their romance loved them too. For September and October my featured sale books include two volumes from this gothic romance series. BONES - This anthology includes a novella of mine called “The Bird” which takes place on an island plantation in the 1840s and involves Voodoo and forbidden passion. Also in the volume are novellas from Kim Fielding, Jamie Fessenden, and BG Thomas. STITCH - This is the first gothic romance anthology. My story, “Reparation”, has a sci-fi Frankenstein theme with a desolate planet, the big, hulking Knox, and the man he saves. Also included in the volume are novellas by Kim Fielding, Jamie Fessenden, and Sue Brown. 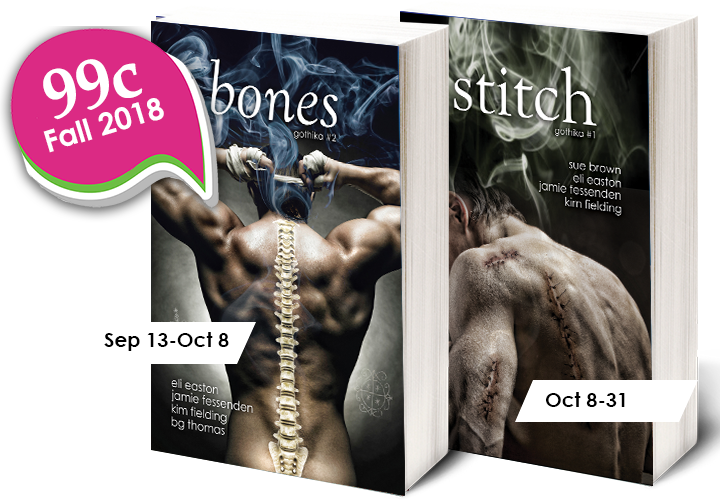 STITCH will be on sale Oct 8-31.